stickboybike: On the Rivet- Cambridge, MD. On the Rivet- Cambridge, MD. Along RT50 in the area known as Dorchester County is a bike shop unlike a lot of bikes shops. OTR is starting their second year and has experienced great growth since the doors opened in 2008. Matt is the store manager and buyer of On the Rivet Cycle Sport and his dad Bob, is the evil genius behind OTR. 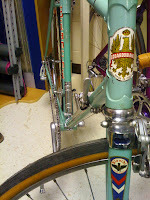 Bob, a self proclaimed Campagnolo officianado, has had his hands and mind on Bianchi long before starting the bike shop. Bianchi to him back in the day was the balistic/holster company that he worked for decades. Bob has crafted the art of handling leather; shaping it into highly desireable firearm holsters. In addition to the leather craft, Bob has had an illness for vintage bicycles. 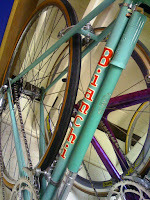 Amoung the American and Italian vintage bikes that he restores to period, are Bianchi Bicycles. And a classic pump too. OTR also supports the Body Scanning system for bicycle fitting, custom builds, bicycle restorations(vintage) and all types of repairs.